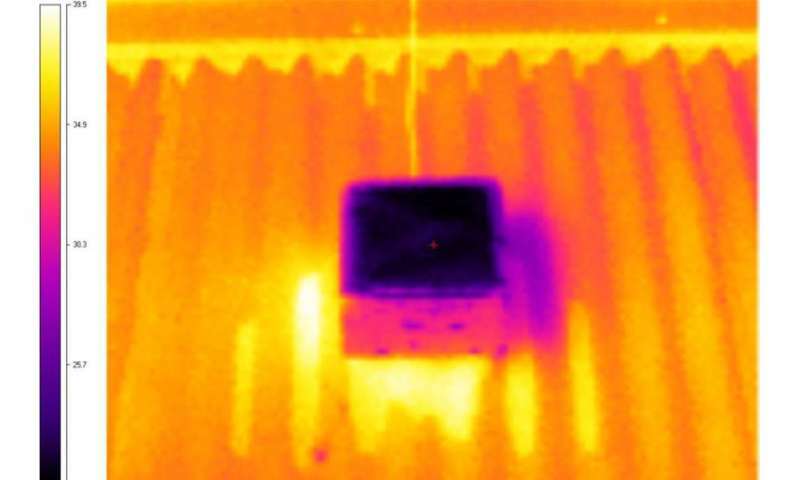 An infrared image showing the temperature difference between the new surface (centre) and an existing cool roof used in testing. 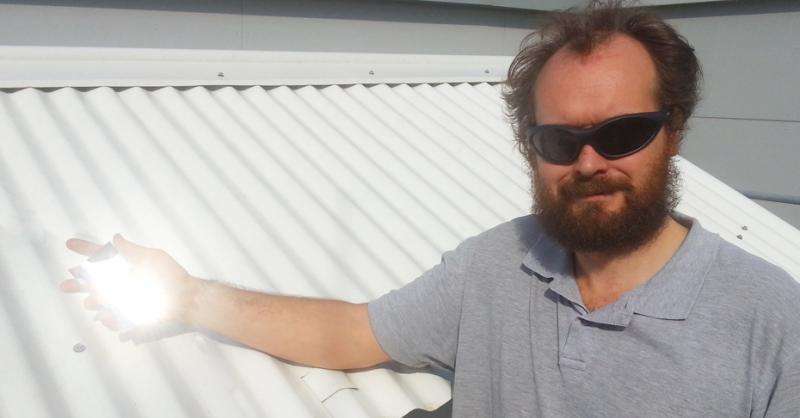 Dr Angus Gentle holding a piece of the special material over an existing cool roof used in testing. "Much of the world's population lives in warm climates. Keeping a roof cool saves energy and makes building interiors comfortable in summer. If enough roofs in a precinct are kept cool then the local climate can also be beneficially influenced," he said. If this material can retain it's properties for it's lifetime without having to be washed on a regular basis it could be quite a breakthrough. I don't think this material is safe; notice how the guy in the picture needs to where sunglasses just to demonstrate his product. If every house had these roofs, it would blind pedestrians, vehicles, and planes worse than laser pointers. Huuummm, that could be a valid point. The law of unintended consequences strikes again. This improved reflection/re-radiation component is not in the damaging wavelengths like UV. Nor would there be much more 'glare' in visible light than snow or white roofs. Anyway, it is mandatory "Health and Safety' guidelines/insurance requirement to wear relevant safety equipment at all times during such experiments/demonstrations involving any kind of glare/radiation which may damage eyes, irrespective. Especially for researchers/workers routinely and often exposed to same as part of daily professional duties. For example, Radiologists have to wear special Lead etc aprons etc to minimize CUMULATIVE exposure damage, even though each x-ray shot is safe. Wow, are you people over-thinking the sunglasses. He's on a roof on a sunny day. The man in the image is holding a mirror and deliberately aiming the reflective beam at the camera. Maybe he is trying to show you all that it is a sunny day. Recently, in Adelaide, Aus, I changed the iron on my roof from grey unpainted zinc to Colorbond white. In previous summers I have needed to run the airconditioning for long periods. But now, even in very hot summer weather, I have to wear warm clothes inside. About 10degC cooler. Now if we could have cold roofs for Canadian summers and hot roofs for Canadian winters, that would be nice. If they could make it superhydrophilic thus getting the water to run off, this would be a version of the "dew collectors" in Frank Herbert's Dune.